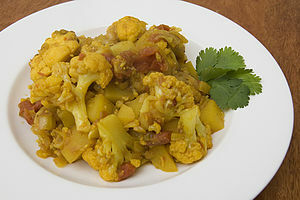 Aloo Gobi (or Gobhi) is a South Asian dish popular in both India and Pakistan. Aloo means potato and Gobi (also spelled Gobhi) means cauliflower. This dish has a prominent role in the movie Bend It Like Beckham. The DVD contains a featurette titled How to cook Aloo gobi. However, the recipe given differs from the following one and the one in the external link below, demonstrating the variety of ways the dish can be prepared. Also, sometimes aloo gobi is made without the tomato. Add jeera (cumin seeds) and wait until they turn a light brown color. Add the spices (except for garam masala) and the tomatoes. When the mixture turns oily, add the vegetables. Roast the cauliflower and the potatoes until they turn soft. Stir occasionally. Add the garam masala, mint and lemon juice. This page was last edited on 19 October 2015, at 20:50.